1. Affliction is suffering due to the pressure of circumstances. The Word of God is stronger than any circumstance. We have to learn to separate the pressure from the problem. Jesus has already overcome any problem that we may face. (See John 16:33) The pressure comes when we allow the circumstances to get to us. That’s taking the bait. Don’t do it. Stay with the Word. 2. Persecution comes from being pursued. It means someone is trying to drive you away. Satan is using people to draw your attention to what “they” are doing to you. He wants you to be offended by what “they” are doing to you. That’s taking the bait. Don’t do it. Stay with the Word. 3. The cares of this world come from paying too much attention to all of the stealing, killing and destroying Satan is doing. Those cares cannot overcome the Word unless you let them get on the inside of you and choke out the Word. The media, gossip, etc. delivers the bait. Don’t take it. Stay with the Word. 4. The deceitfulness of riches sneaks in when Christians begin to see money the way the world sees it. The deceitfulness of riches will draw you into a place of trusting money and draw you away from spending time in the Word and in prayer. Don’t take the bait. Stay with the Word. 5. Lusts of other things include anything that brings pressure and unrest through a desire that’s gotten out of hand. It’s often sexual, but not always. It could be a desire to hang with the wrong crowd. It could be a desire to spend money that you don’t have. Whatever it is, it is always something that gratifies the flesh. It creates the atmosphere for covetousness and will even cause you to not want to hear what the Word has to say about it. Don’t take the bait. Stay with the Word. Jesus wants you to live the abundant life. So, resist the Enemy’s tricks! 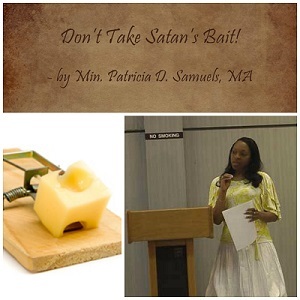 If you’ve taken Satan’s bait and fallen into a trap, cry out to God to get you out! He will do it. Thank you for reading! Please share any aha’s, comments or questions below. I would love to connect with you here. Please share with your friends also, using the buttons below and thank you for sowing financial seed into Patricia Samuels Ministries to enable the Gospel to be spread throughout the earth! Thank you sister Patricia, this just the word i needed; to minister to the guys when i go the the prison next week. Thank You.